VOL. II. THiURSDAY, 12'Tr SEPTEMiBERl, 19'7. of the 4t Jluly. 1957 and in the St.
St. Kitts. Nevis, Son mbrero, AjiLuilla. 9th Sferte hb'be I'.. .
R ef o. o. oi71 ,s.
Rl,;u:ilations, 1957." 'p. Price 10 cls. 1 2 7;', t" pp '; i, cis. (No. 1 of 1952). lpp. Price 3 cts. CoK clom." t 1 tp. /'rice 3c. date I'' oli dhig ;a Grier, and E.etine." P1 )t ! 'rsrra, 3 comnts. days from 9.00 a.m. to 3.00 p.m. Dated the 27th (lay of August, 1957.
to registratPion ,f thil sii! '1Trade Mark. rE",istration '" the said Trade M-rk. l. /itru/ of I',tado Mar/, is. d.at. of their said Ap;lii'o;i( . tion of the said Tn'rade iar.k. of their said A Il ';. '- i,,hi. Friday (;th September. 1'.:, . accept the lowest or any T-I.'I. r.
ow 1., ral I F tN'I'.II" ] Iini. hitv usedl this mark since April, 11.7.
pegi"alol r oe T'rade Marks. usind this 1%I 4, 2,'u' sine May. 1957.
iflij~i('1l 1( l t'. I''f T'r'I 1 ade. On receipt of the news 4o the railway accident in Jamaica the following msage ,of symipati-; was des!patchted. by His 1'-. .llency the Governir to the Acting Governor, Jamaica, on the 3rd September, 1957.
deep symiatnhy for the victims of this terrible disaster their relatives and friends. (io ernor. l',I'i /e / T/hrnds." A\N'riGUA, 30th August, J. .'7. in Class 45 that is to pay: Tobacco whether manufactured or unmanufactured. the said goods for 37, 30, 23, 4 & 37 years respectively before the date of their said Application. Dated the30th diay of Au.lst, 1957. CECIL 0. BY O' '. Kegi.i9rar of tlhe Sjpfiremio ('ourl. TiOAii \i .On'11- O'FFIK . \N'! ;( o :. 1 thi A. gu.. 1957.
in C 43 that is to say: Rum. of th.- ,aid 'i ;:ote :Mark. /isgistLrei' Of 7"'afd, 110. k.8. AN'TIIrut, 20rh Aug ust, 1957.
coatois La'i,. fliu ; :;;i York lHouse. Mark consisting of lthe following: ..
in C(. !iss 1 that is to w::v: ,aiints. of the said Trade Mmu k.
AN'J'i(ITA, !' 'l: August, 1957.
in ChOlii 45 that is to sa i : Cigarettes. of the said Trad,~ Mark. i,-_ J 7' aao? -Warlis. in Clas 45 that is ,,o say:-Cigarett,. Application as Feruary, 1 15. Registrar ,f ,'- / .- Marks. in (la. ;' u! ; i o ;y:- Cig rettes. Tiln as May 1st. 1957. F' g. 0. ( i VlRISk. It-reunder for the lighting ,f vehicles. l).ed this 22nd- d.s\ of A .-'-t.
19in3. 19 195 1951u 1957. Class 22 that is to say: trucks, vans. trailers, carts and tractors. before the (late of their said A application. opposition to registration of the said Trade Mark. by E. M. BLacKM.i, Government Printer.-By Authority. storage undertaking in the Colony. WHI ERiEAS it is expedient to raise a loan Preamble. Development (Electricity) Loan Ordinance, 1957.
as nearly as may. be the sum of six hundred 62.,ooo. ANTIGUA. 2 Development (Electricity) Loan No. of 1957.
and assets of the Colony. specified in the Schedule hereto. interest on the day on which it falls due. the loan shall commence to run. loan at its due date. ANTIGUA. 4 Development (Electricity) Loan. by E. M. BLAnr.OAN, Government Printer.-By Authority. 2 Income Tax (Amendment) No. (ii) by deleting the words "or place". rate of Commillonwel lth income tax"
the warrant is directed and to sell in . the provisions of this Ordinance." nance shall be renamed "SECOND SCHEDULE". MONTSEPsRAT 2 Title by Registration Act No. of 1952.
land ds irs-d in the request. the owner of the land. thereof in the said newspaper. notification to individuals or generally. MO.Twr.w-.l 4 Title by Registration Act No. of 1957.
to him appear-just and reasonalbe. ject to an appeal to a Judge in Chambers. "Crown Proct'tedu 11w':- i)Ortditlnance, 1954"
subsection (2) of the section. section (2) of the section. well as section 13" for "Sections 12 and 13"
34B. Where a certificate of title has '1..le a.
a first .certificate of title and, when there plan. I-'li:Il *, of title when issued. MO1TSERRA't 6 Title by Registration Act No, of 1957.
respective portions at their expense. and the words "if suchh. rncipal the words "assurance fund". (No. 15 of 1950) of the same Colony. STATUTORY RULES AND ORDER . THa PINSIONS AMENDMENTN) REGULATION'S, 1.s7. Tmi PENSIONS ACT, 1947 (No. 12/1947). after called the Principal Regulations. the Governmnent of the Colony "
Governm ent of the Colony"
by E. M. BLtKMAN, GOVERNMENT PRINTE,.-By Authority. ORDINANCE, 1955 (No. 5 or 1955). of January and ending on the 31st of December. appointed as an Officer of the Force. (d) Lieutenants and Second Lieutenants. proper and as the Governor may from time to time direct. be promoted, after 12 months service, to the rank of Lieutenant. not served in the lower rank. shall not be extended by more than (i years. 8. PRELIMINARIES TO ENLISTMENT UNDER SECTION 12(1). and liabilities, of a member of the Force. stands the tntunr and purport of such document. from time to time approved by the Commanding Officer. are below such standards of fitness. engaged may be required to undergo a medical examination. or more Surgeons of the Force appointed under regulation 4(2). 10). PEtiO.NS INELIGIBLE FOR ENLISTMENT IN THE FORCE. the Force on his attaining the age of 50 years. shall not be less than 7 hours. officer before he was approved as atoresaid as an instructor. the quarter during which a member of the Force so qualifies. period of annual training or embodiment. retained for military duty shall be paid a gratuity of $5. 18. DisAri Ii.TiO (( Io N [oNIIO ARMIS AND APPOINT. many consider best for the efficiency of the Force. set out in the Schedule. UP IN GOOD ORDER BY OTHER RANKS ON LEAVING THE FORCE. (fair wear and tear excepted) l:is arms, uniform and equipment. time to time by the Coimmanding Officer. AND Or OOFFICEI IN TEMPORARYY COMMAND OF THE FORCE. other orders relating to such command. purpose other than ordinary current expenditure. Commanding Oil. 'S-r shall from time to time approve. Commanding Officer shall from time to time approve. Surgeons of the Force appointed under regulation 4(2). the nature of his duty. 30. LEAVE FROM DUTY AS AS IMBER OF THE FORCE. 3I. MONETARY AWA\lRD TO MEMBERS 01F THE FORCE. duties relating to the Force. T[.1-. this 3rd day of September, 1957. For Non-Commissioned Oi. i rs and men. or gaiters, and black boots. Web belt with bayonet frog. Side arms, and web equipment. of Sam Browne belt and sword. For Non-( nomiwsioned 0Oi, < an d men. brown brogue shoes, Sam Browne belt and sword. seam. Black patent leather boots or shoes. Printed at the Government Printing Office, Antigna, Leeward Islands. by E. M. BLANCKMAN, M.B.E., Government Printer.--By Authority. 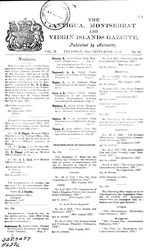 by the Governor by Proclamation published in the Gazette. by E M. BLAnK.fAN. GOVERNMENT PRINTER.-By Authority. (c) by deleting the proviso to the paragraph. by E. M. BLACKMAN., Government Printer. By Authority. "Bethel" immediately below the word St. Patrick's." by E.M. BLAOKMAN, Govornment Printer.-By Authority. entitled to vote as required by the said section. the said Ordinance, in the Gazette and in one or more news. resides notice of his claim to be registered as a voter. due notice hereof and give their ready obedience accordingly. sixth year of Her Majesty's reign. by E.. BLACKMAN, Government Printer.-By Authority. LEGISLATIVE COUNCIL OF THE COLONY. BY THE GOVERNOR OF THE LEEWARD ISLANDS. dissolve the said Council on the 1st day of October, 1957.
in the sixth year of Her Majesty's reign. STA'I FTORY RULES AND ORDERS. DATE FOR HOLDING A GENERAL ELECTION. dissolved as and from the 1st day of October, 1957.
on the 15th day of October, 1957. Printed at t e Government Printing Offioa. Antigua, Leviard I.lanIls. by E. M. BLACKMAN, GOVERNMENT PRINTEI.-By Authority.